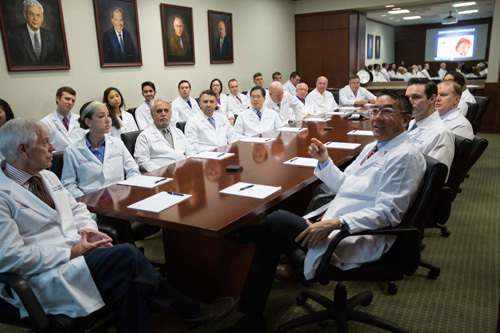 The UF College of Medicine’s department of urology’s chair , Li-Ming Su, M.D., right, and fellow urologists from the department gather in their urology conference room to discuss recent cases. The University of Florida College of Medicine’s department of urology in October will celebrate 60 years of training resident physicians and serving patients across North Central Florida. In 1958, urology services were first offered within a small division under the college’s department of surgery. Over the next 20 years, a kidney stone surgeon, pediatric surgeon and urologic oncologist were added to broaden the division’s scope of services. In 2005, the urology division became a department at the UF College of Medicine. This shift required hiring a diversified team of 12 faculty members and expanding its clinical footprint to meet higher patient demands and to provide more specialized care. laparoscopic and robotic surgery, and reconstructive urology. The training program also grew to train three residents and one fellow each year. The team now sees approximately 21,500 clinic patients each year and performs over 3,000 surgeries annually. The department has been at the forefront of development and clinical application of new technologies. UF Health Shands Hospital housed one of the first extracorporeal shock wave lithotripsy, or ESWL, machines in the country, a device that uses shock waves to break apart solid kidney stones from outside of the body in a completely noninvasive manner. A former UF Health urologist, Birdwell Finlayson, M.D., was one of a handful of urologists in the country who helped revolutionize the treatment of kidney stones using ESWL, which in many instances replaced open surgical stone surgeries. ESWL to this day remains a staple in urologic care for kidney stones. Since then, medical technology has advanced and urologic surgical approaches have evolved to become less invasive in other areas of urologic care, such as urologic cancer. Robotics and laparoscopic surgery have helped UF Health urologists move away from invasive open surgeries and toward minimally invasive “keyhole” approaches that have resulted in less pain, faster patient recovery and fewer blood transfusions. The da Vinci™ Surgical Robotic System emerged as the standard of care for the surgical treatment for prostate and kidney cancers and provides a 3D, high-definition and 15x magnified view of the internal anatomy while using miniature instruments to dissect and reconstruct tissues with great precision. Lastly, UF Health urologists are using precision-targeted prostate biopsy techniques for the detection of prostate cancer, using 3D MRI images on real-time ultrasound, much like a GPS system, to improve accuracy of prostate biopsies, as well as guide further therapy. 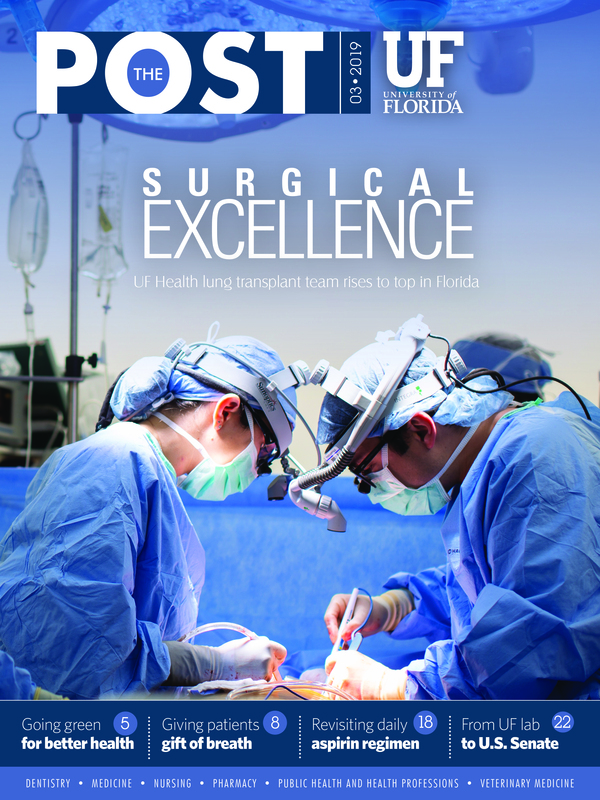 These state-of-the-art advances have moved UF Health Urology into the forefront of patient care not only in the region but also the Southeastern United States. “We ensure that patients coming through our door are evaluated by the most appropriate set of physicians based on their unique circumstances to ensure the utmost patient-centered care,” said Li-Ming Su, M.D., the department of urology chair and David A. Cofrin Professor of Urologic Oncology. Timely and effective access to a group of multispecialty physicians at the same clinic visit reduces the number of trips to the hospital, which is important for cancer patients and their families. In 2008, after the department’s 50th anniversary, UroGators Alumni Society was born. This alumni society is composed of former residents, fellows and UF College of Medicine urology faculty. The group fosters education and sharing of ideas and experiences by bringing together academic urologists with community-based physicians who have all trained or previously contributed to the department. “We have a tight-knit and collegial department with a very rich history of urologic training and discovery,” said Thomas Stringer, M.D., UF Health Urology associate chair and UroGators president. Stringer completed his residency from 1975 to 1980 at UF and returned full-time in 2011 after 30 years as an adjunct professor. Moving forward, the department has several goals, such as further expanding its clinical offerings in men’s health, male infertility and urologic oncology, as well as increasing clinical trials offerings for urologic cancers in efforts to help the UF Health Cancer Center earn National Cancer Institute designation. The 60th anniversary ceremony will be hel, in early October, at the Cade Museum and will feature alumni and faculty speakers from every era of the UF College of Medicine department of urology’s timeline, with each speaker reminiscing and discussing how the department changed and grew during their time within the department.